Travel, motorcycles, overlanding, presentations, training, rides, equipment companies, great camping, top beer (at a great price) music and so it goes on. Oh and there will be some top authors book signing too! 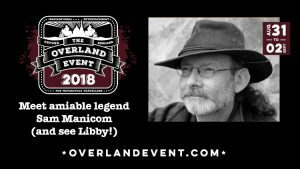 ‘Meet the irrepressible Sam Manicom at The Overland Event. Would you like to know more about the event? Then just click on this link!